Soothe your soul with sparkling floors, smooth skin, and spotless dishes. 1. 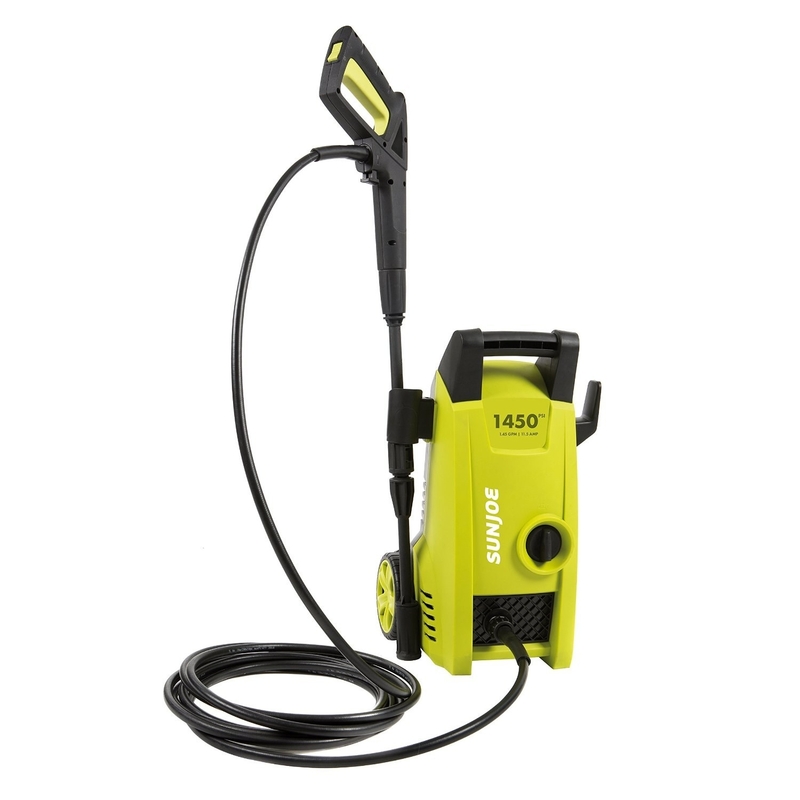 A mini electric power washer that'll shoot off grime wherever you aim it. Use this bad boy to clean boats, motorcycles, RV’s, ATV’s, trailers, decks, barbecues, siding and more. The adjustable spray nozzle allows you to change water speeds and intensity. Plus you can easily wheel it around from one job to another. Get it for $77.70 and the driveway, deck, and patio attachment for $11.16, both on Amazon. 2. A pet fur removal brush best for furniture, carpets, and clothing when your beloved 'lil animal decides to rub up against everything you own. This double-sided brush will combat any loose hair that may be collecting on your bed, sofa, rug, or clothes. Just work in the direction of the brush's bristles and sweep against the grain. 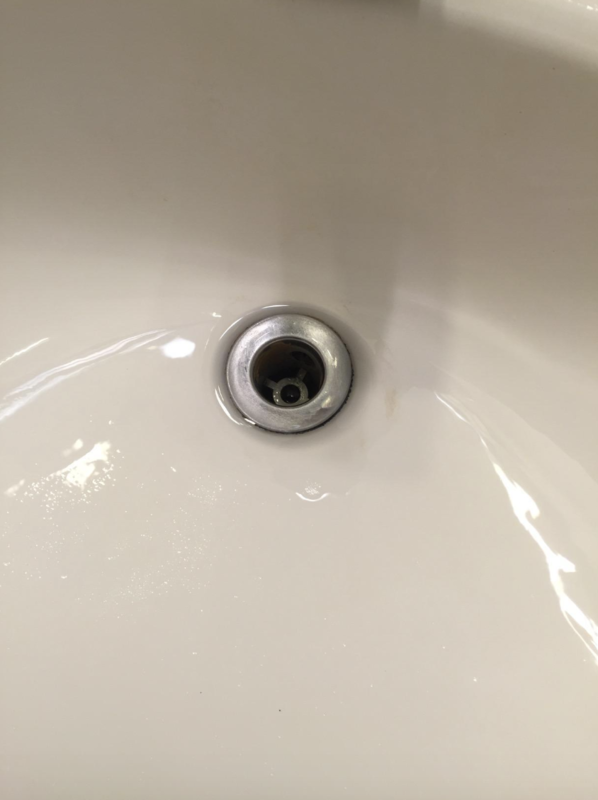 When the brush is fully covered, insert it into the holder to remove everything and start again! 3. 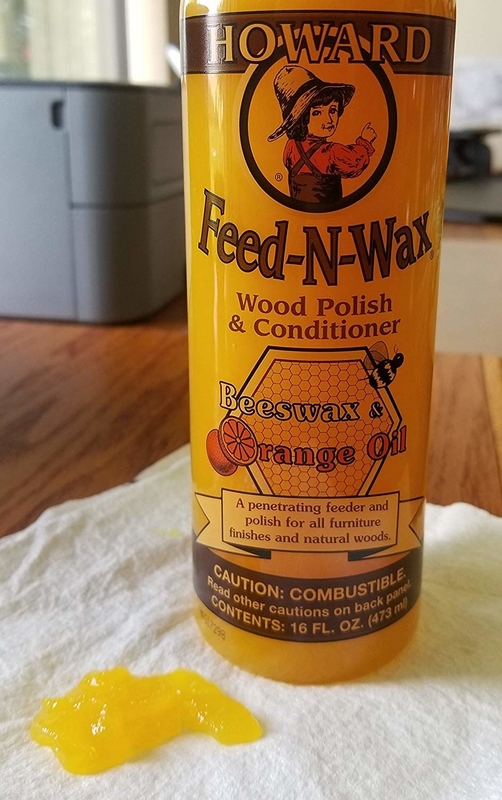 A wax polish designed to shine wood and enhance its natural grain. 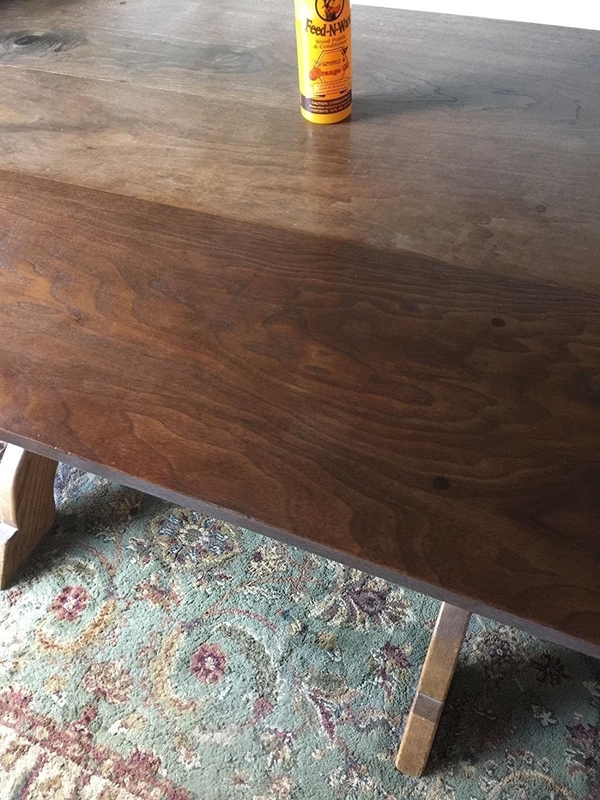 If your kitchen cabinets or dining table look a bit...faded, then this product is for you! You can apply directly to antiques, door trims, benches, and honestly whatever wood you may have in your home that needs brightening. The beeswax and orange oil will soak in, leaving a protective coat to prevent future drying and deterioration. Get it from Amazon for $7.98+ (available in multiple sizes and quantities). 4. A magnetic scrubber for those incredibly hard-to-reach nooks and crannies in glassware. The nubbed pieces won't scratch what you're scrubbing, but will remove tough stains. 5. 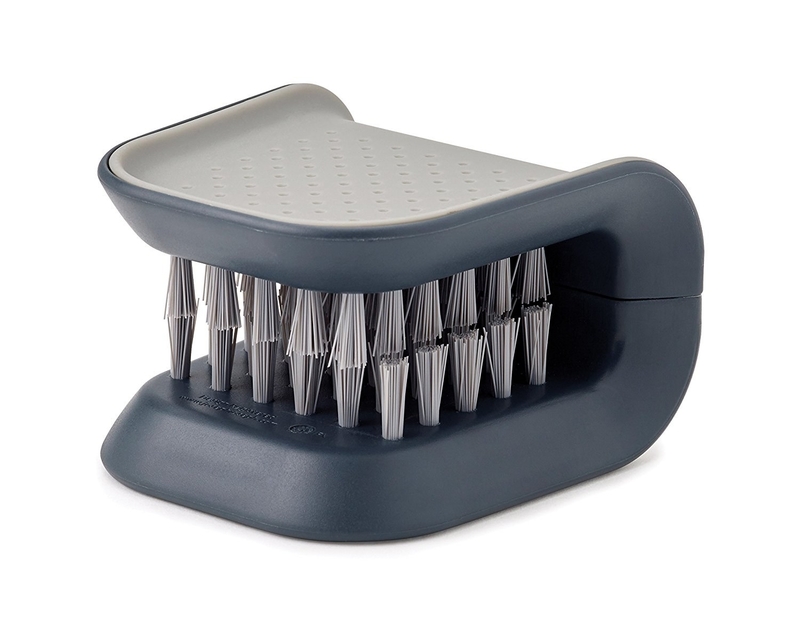 A foot scrubber that'll massage your arch and reach between your toes to remove dead skin. Plus it could improve overall circulation. Get it from Amazon for $14.49 (available in two colors). 6. 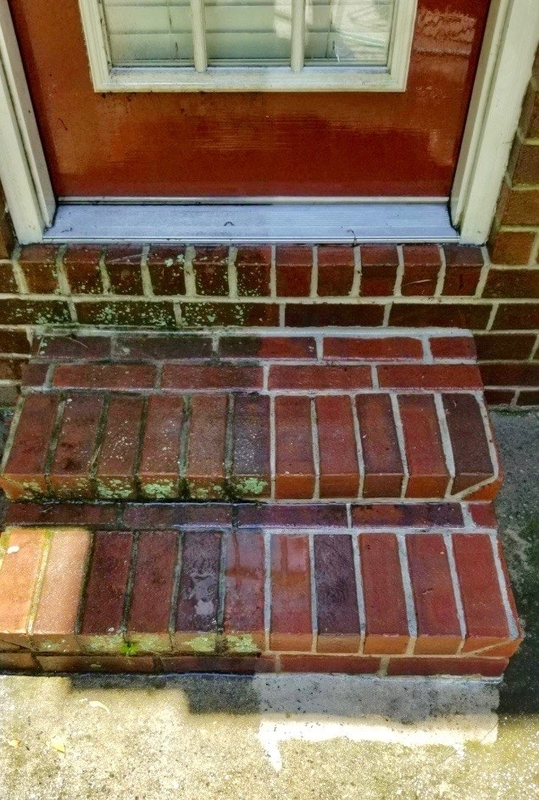 A disinfectant spray to help you tackle icky mold and mildew without the use of bleach. It also removes grease, stains, and bacteria in only 45 seconds. Try it on tools, tires, vinyl, stainless steel, engines, plastic, rubber, walls and ceilings, concrete, sinks, showers and bathtubs, plus more! It's safe for inside and outside the home (think pool, garage, and office). Get a 32-ounce bottle from Amazon for $5.28+ (available in one gallon and a pack of four). 7. 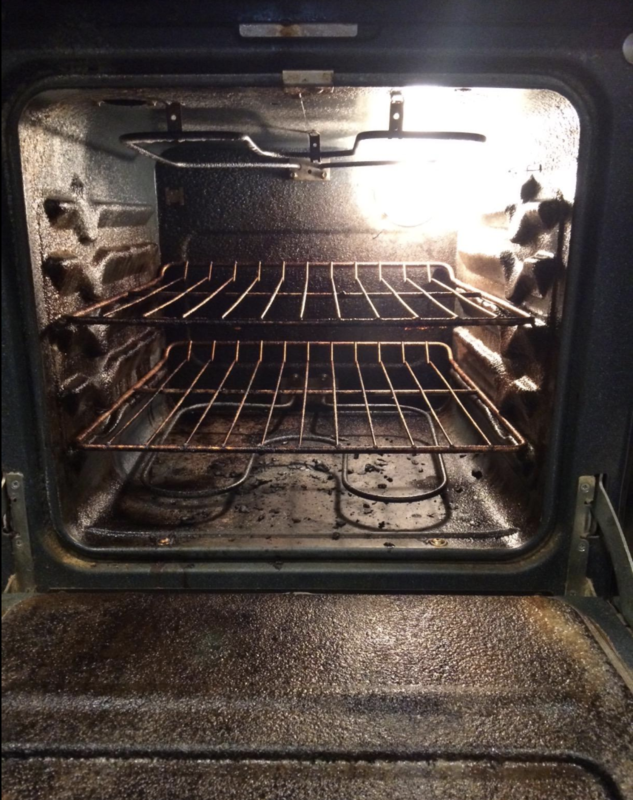 An oven cleaner strong enough to remove years worth of baked-on spills. Now you'll actually want to cook! This spray will cut through even the toughest of stains and has a zesty lemon scent. 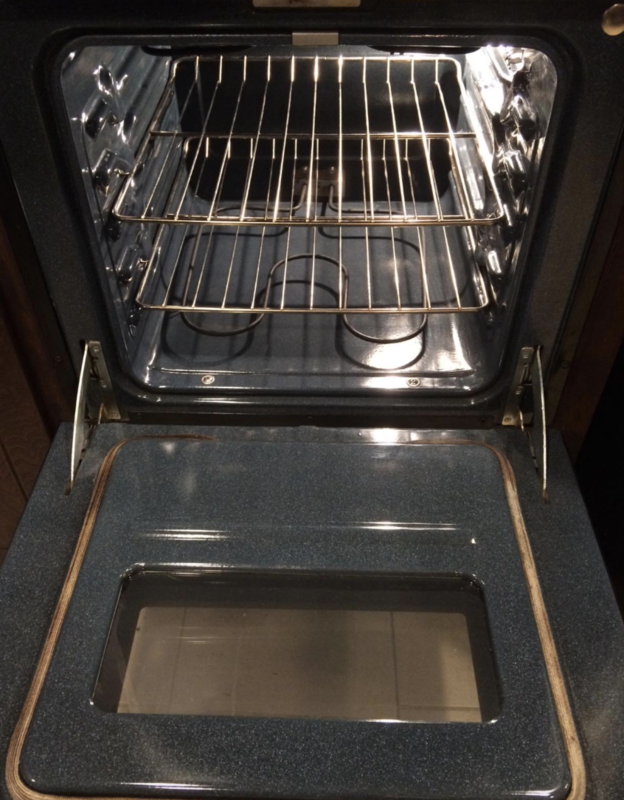 It's safe to use without gloves on ovens, broilers, and grills. 8. 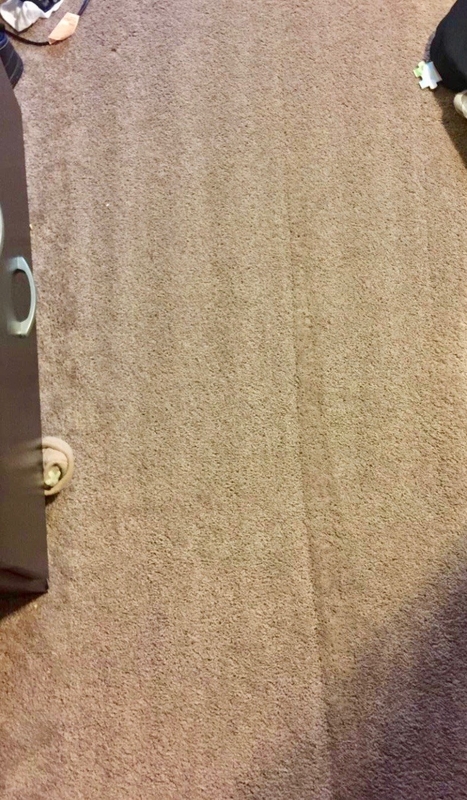 A carpet washer so you never have to feel guilty about knocking over your wine again. Even though that truly is an unfortunate event, and I am sincerely sorry. My mom and I have used this washer on literally every carpet in my childhood home and it's been amazing. You can see the tank fill with dirty water while you're using it. 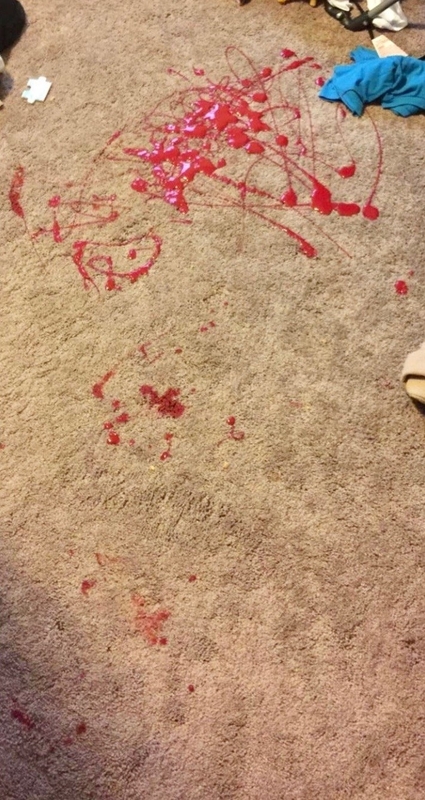 It's surprisingly satisfying to know how much junk you remove from the carpet. It's also lightweight and easy to carry from room to room. It comes with an instructional book and small bottle of solution to get you started. Attachments include a SpinScrub powered hand tool, a stair tool, an upholstery tool and a crevice tool. Get it from Amazon for $125.99+. 9. A pair of exfoliating gloves that'll unclog pores and help get rid of ingrown hairs, flaky skin, and stress (because it feels amazing – DUH). Get a pair from Amazon for $9.49. 10. A plant-based spot and odor eliminator wonderful for those with kids who decide that their food looks wayyyyy better on their shirt than in their mouths! This spray is made from all-natural ingredients, is hypoallergenic, gluten-free, non-toxic, non-bleaching, biodegradable, vegan, and certified cruelty-free. Get a 25-ounce bottle from Amazon for $11.53+ (available in larger quantities and as a refillable pouch). 11. 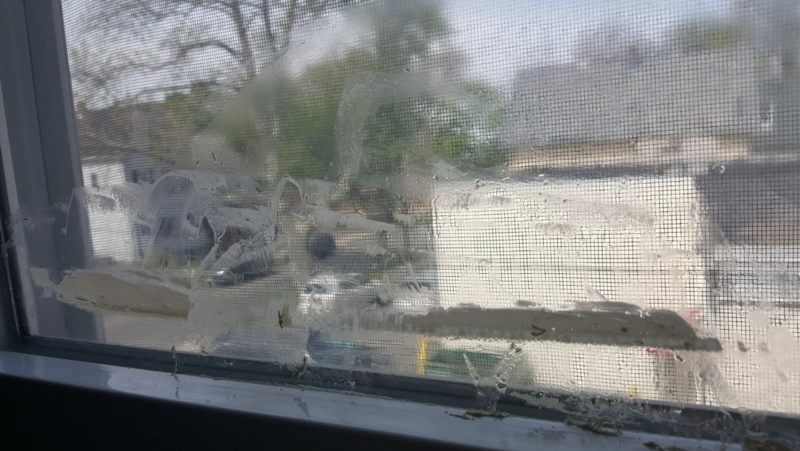 An adhesive remover aimed at banishing sticky goo, decals, tape, and gum from unwanted places (like your bedroom window). Get it from Amazon for $7.60+. 12. A headlight restoration kit to combat foggy, yellowed, and scratched lights so you can drive at night with ease. AND IT COSTS LESS THAN $10!! It can be used on plexiglass and plastic surfaces. Upon purchase, you receive three restoration pads of various grits, a spray lubricant, a lens clarifying compound, and a lens sealing wipe. Get it from Amazon for $7.29+. 13. A magic eraser because it will literally get anything off of anything. Seriously. I've used this. I use this on my apartment walls to rid of scuff marks. It really is magic, but you can use it anywhere for dirt marks. It's great for showers, tubs, tabletops, ovens, light switches, and more. All you need is a splash of water. Get a pack of eight from Amazon for $6.82. 14. A knife and cutlery brush so you never have to worry about accidentally cutting a finger off when washing dishes. 15. A gutter mop perfect for banishing black streaks so you can achieve pearly white gutters to increase your home's curb appeal. When you're done, just wash and dry for the next use! Get it for $22.97 and the extension pole for $22.20 (available in five lengths), both on Amazon. 16. A face exfoliator to eliminate *annoying* breakouts and keep your skin feeling silky smooth. It's dermatologist tested and made without plastic beads. 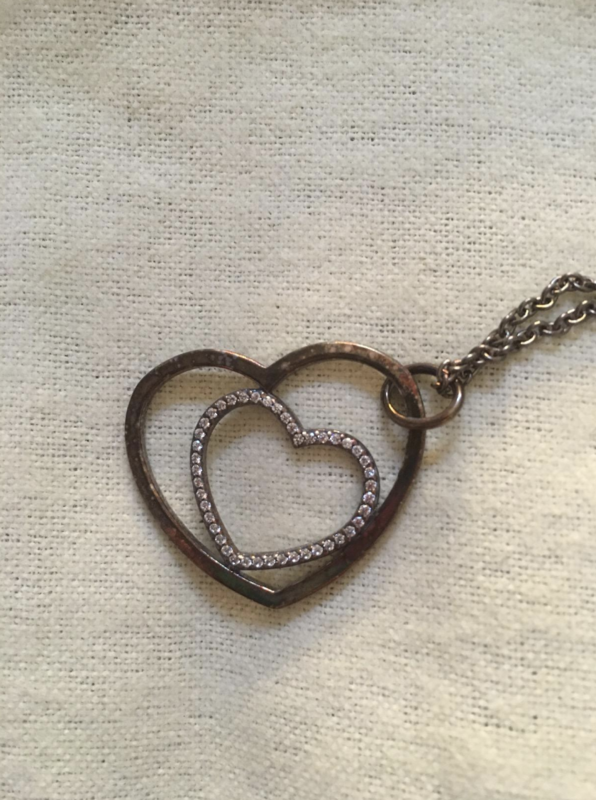 Get it from Amazon for $6.14. 17. A bottle brush cleaner because honestly when's the last time you sufficiently cleaned your reusable water bottle??? NEVER, PUT YOUR HAND DOWN. If you've ever noticed a ~weird~ smell coming from your water bottle, then this is for you. This brush will hit all those deep down spots that your hand (and sponge) can't reach. 18. A car polisher that'll buff out some scratches, restore shine, and remove paint marks. 19. A swimming pool brush effective against built-up algae. Now you can doggy paddle with peace of mind. This curved brush is fantastic for getting into corners. Just a note: be careful with vinyl pool liners. The nylon and wire bristles are sharp! Get it for $15.99 and the extension pole for $21.23, both on Amazon. 20. 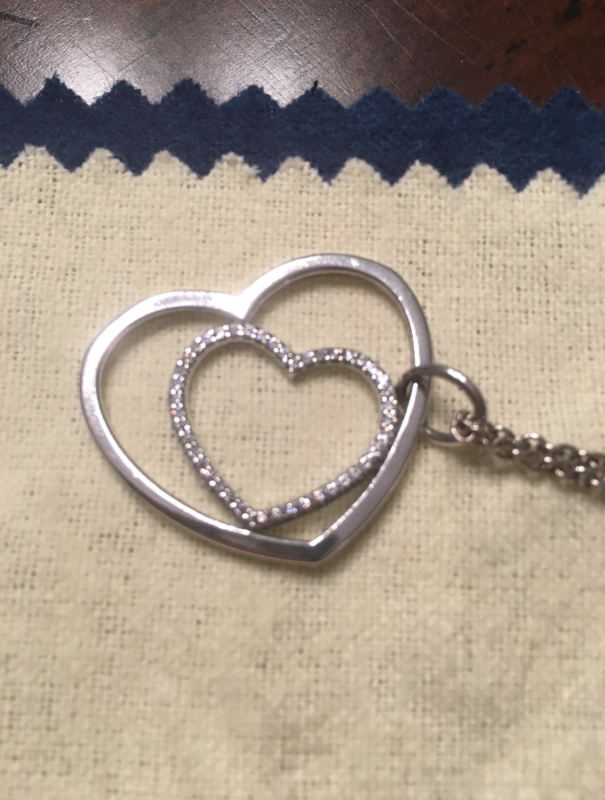 A jewelry polishing cloth so impressive you literally won't believe your eyes. Plus it's made of cotton so it won't scratch a single piece. Get it from Amazon for $6.99+ (available individually or sold as a set of three). 21. A pumice stone with a handle to fight hard-water stains while protecting your hands. Get it from Amazon for $7.99+ (available individually or as a set of two). 22. 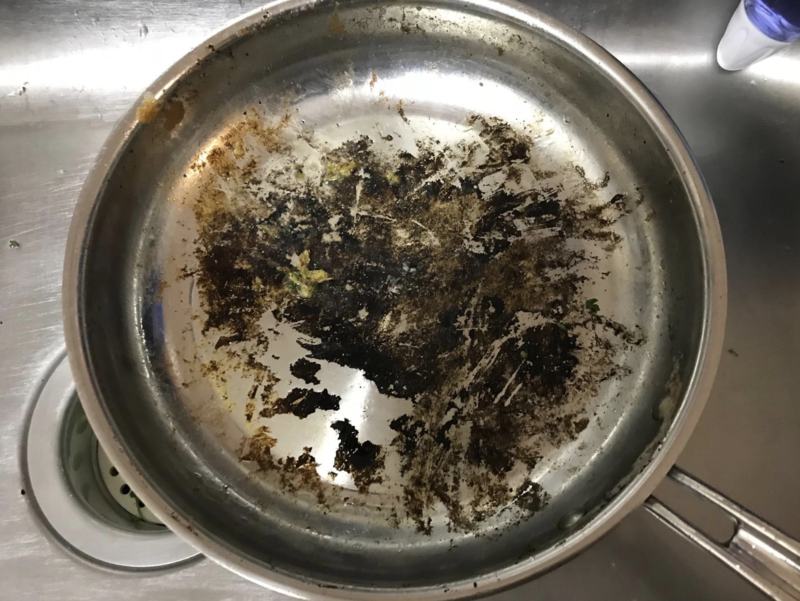 A bottle of Bar Keepers Friend because everyone deserves a bestie who will clean up after them when they horribly burn their food while cooking. 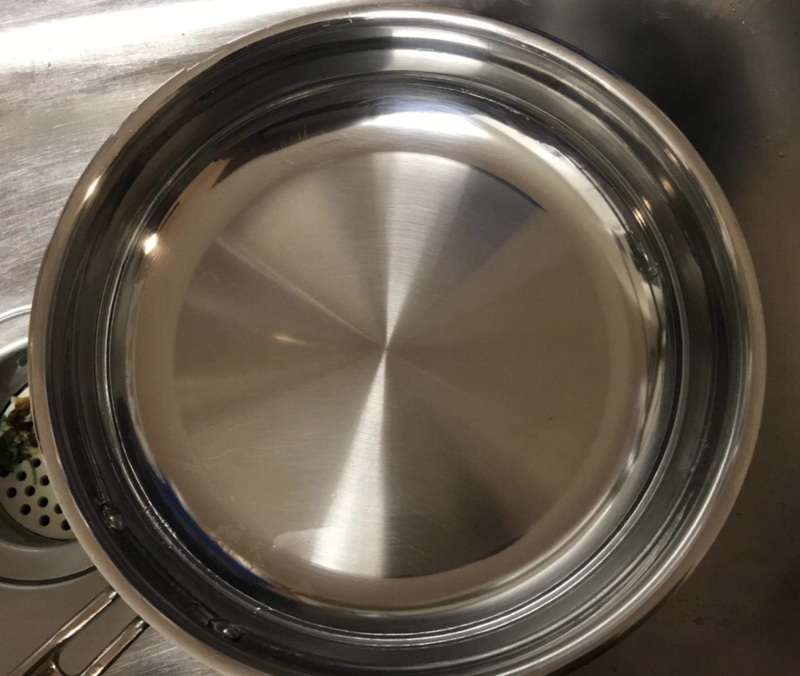 Use this cleaner for kitchen cookware, cooktops, stainless steel appliances, copper pans, sinks, bathtubs, shower stalls and more. Plus when you purchase, you get a non-abrasive cloth that won't fall apart or build up smells like some dish sponges. Get it from Amazon for $12.99+ (available in three versions and with a deep clean brush set). 23. 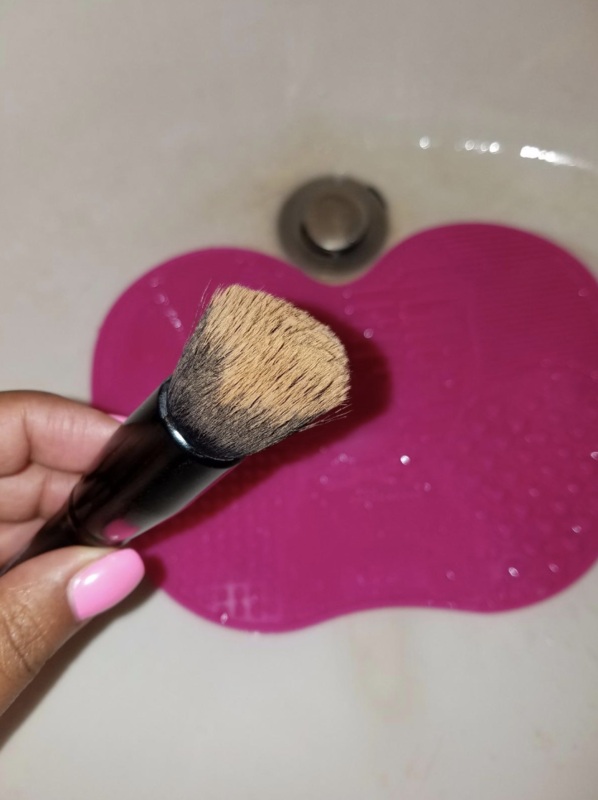 A makeup brush cleaner that'll suction to your sink so you can wash every brush in just a matter of seconds. This is a two-piece set! You get one larger suction pad and one smaller that also fits securley in your hand. Promising review: "This mat is amazing. I took it for a spin today and was very happy with the results. 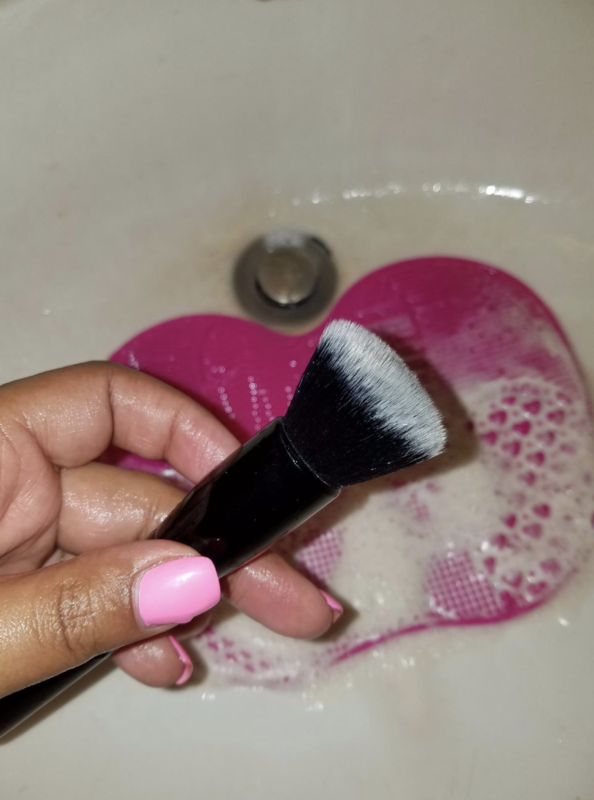 I usually have to put in quite a bit of elbow grease to clean my foundation brushes, but this made the process super easy and much faster than usual. 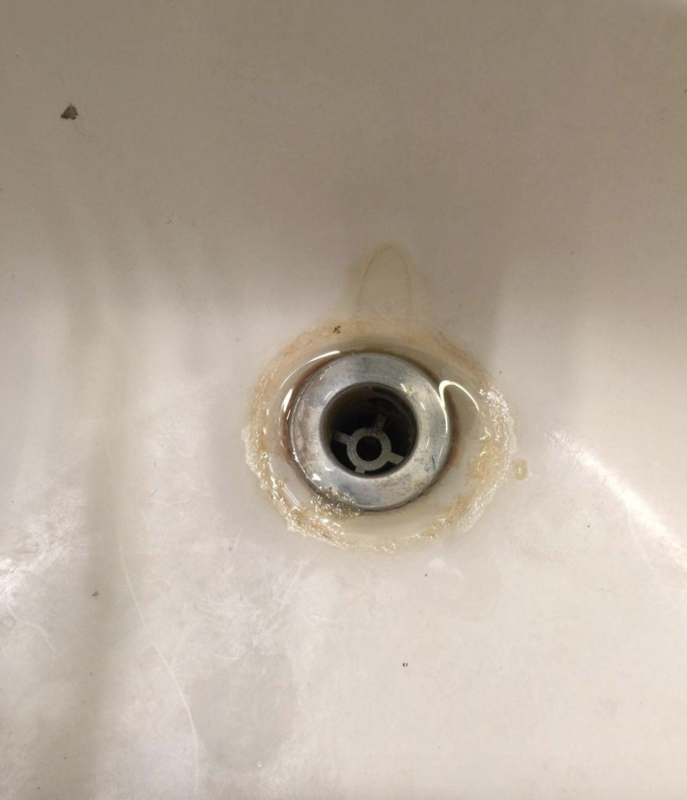 The suction cups kept it steady in my sink. And the shipping was pretty quick. All in all, I love it!" —Quianna M.
24. A microplane foot file designed to save you *hundreds* of dollars on pedicures and callus removers. Nothing makes you feel better than clean and smooth feet, amiright?!?!? Get it from Amazon for $7.86+ (available in larger quantities). 25. An all-purpose powder able to clean really anything, but that works especially well as prep for waxing or repainting. It won't streak and can be used on almost any surface. Get it from Amazon for $8.75+ (available individually or as a set of two). 26. A bottle of basic dish soap for when you want to get ~down and dirty~ with your dishes. Mrs. Meyer's dish soap is not tested on animals or made with artificial colors. It's paraben-free and contains plant-derived ingredients. Get a pack of three from Amazon for $10.99+ (also available as a pack of six). 27. 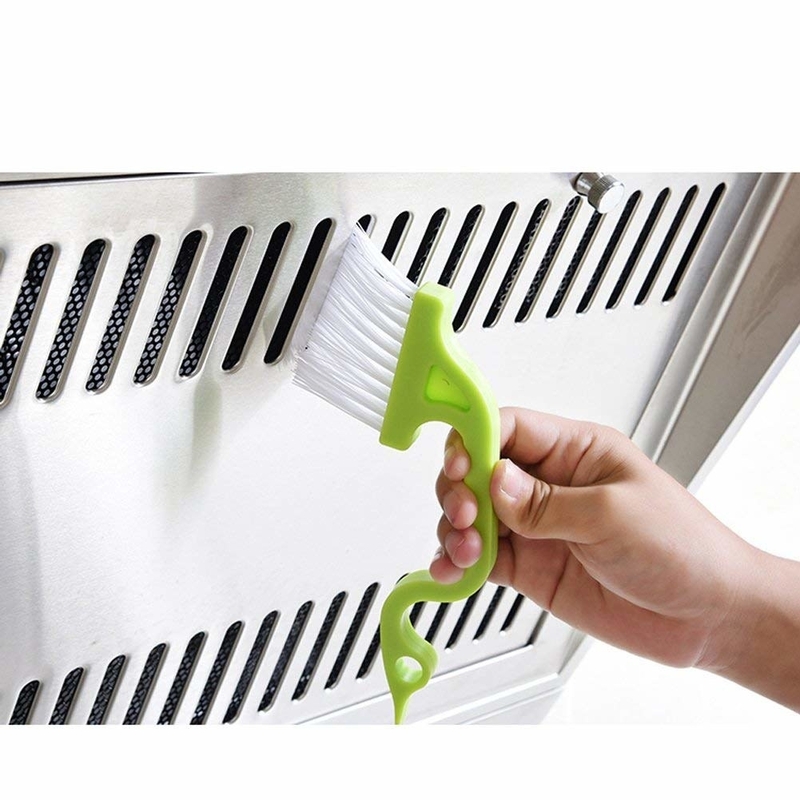 Speaking of dirty dishes, this soap-dispensing brush will work wonders on pots, pans, and everything in-between. I own one of these and absolutely love it. The handle makes controlling the brush very easy. I refill it with soap maybe once a month, and can change the brush head whenever I feel it's getting too dirty. It just pops right off. An added bonus? 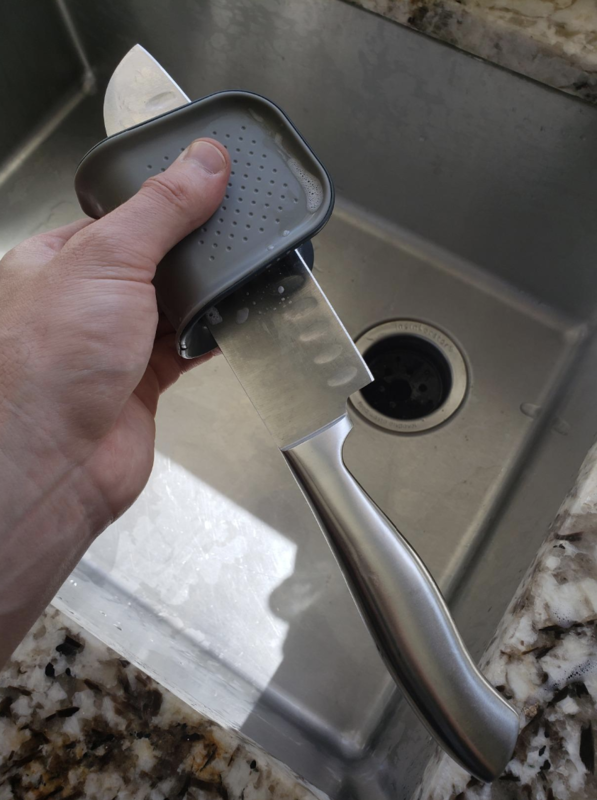 The scraper on the backside of the brush helps fight caked-on food. 28. A microfiber cloth so ultra soft, it won't scratch paint or mess up furniture finishes. It even absorbs eight times its own weight! Get an assorted pack of 24 towels from Amazon for $9.46+ (available in larger quantities in white, blue, and yellow). 29. A pair of mop socks because you haven't truly scrubbed your floors until you've rocked out in these babies like Mrs. Doubtfire. Don't get your socks dirty! Ditch 'em for a pair of these so your floors shine faster. 30. 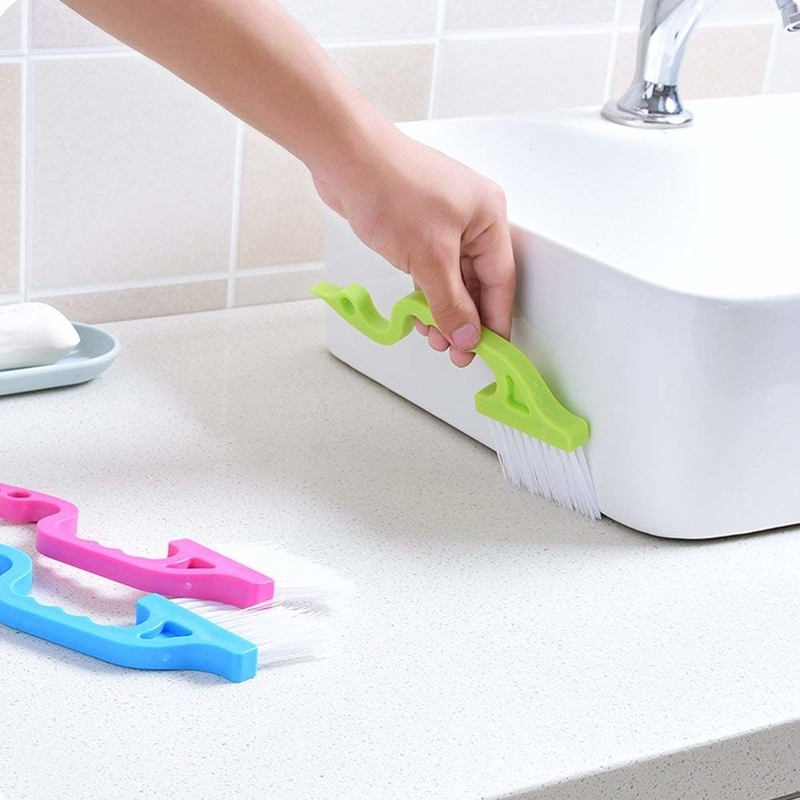 And finally, a gap cleaner for all those impossible-to-reach places that collect dust, grime, and other disgusting stuff I don't even want to explain. 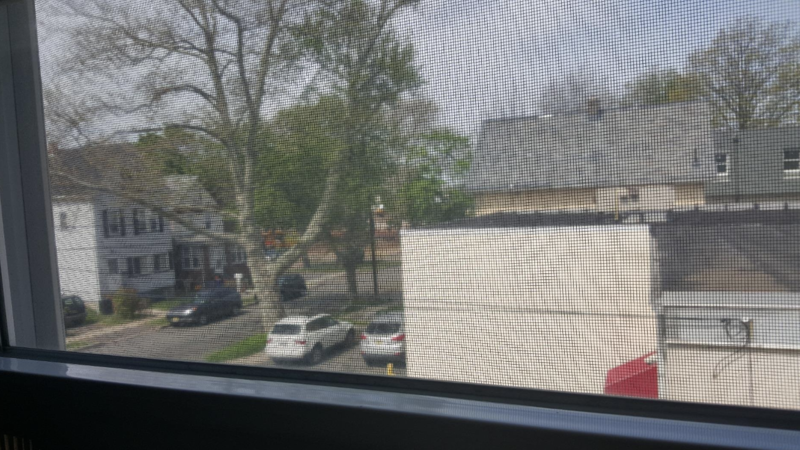 Clean your sliding window and door tracks, crevices around your sink, your air vents, and those annoying gaps in your stovetop. The curved handle allows you to properly grip the brush without blocking your view. Get it from Amazon for $4.98 (available in three colors).